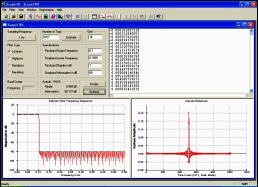 Application: Signal strength measurement, AM demodulation, etc. Advantages: This estimation algorithm is very quick compared to calculating magnitude to full precision using a square-root operation. Given a complex number represented as “I + jQ”, the magnitude is: sqrt(I**2 + Q**2). Unfortunately, the square-root operation in this formula is inherently slow and complicated to calculate, either in software or in hardware. For applications which do not require a full-precision magnitude value, the use of a magnitude _estimation_ can save calculations. This well-known and widely used algorithm is a true gem of DSP because it provides considerable savings in calculation, at the cost of only a minimal loss of accuracy. “Alpha” and “Beta” are two constants whose values can be chosen to trade among RMS error, peak error, and implementation complexity. The absolute value operations folds the complex number into the range of 0-90 degrees, and the min, max operations further fold the complex number into the range of 0-45 degrees. Within this limited range, a linear combination of I and Q are a good approximation of magnitude. If you need a more accurate estimation than this algorithm provides, you can use some variation of it. For example, varying values of Alpha and Beta can be taken from a small lookup table, driven by the relative size of min and max values. Another possibility is to use this estimate as the “seed” of an iterative magnitude estimator. As an alternative, consider using the CORDIC algorithm, especially in hardware applications. This algorithm is described in Understanding Digital Signal Processing by Richard G. Lyons [Lyo97], in Digital Signal Processing in Communication Systems by Marvin E. Frerking [Fre94], and elsewhere. Thanks to Clay S. Turner for providing some of the coefficients. *   estimation is very quick. *   resulting RMS and peak errors. * appear in all source copies. THIS SOFTWARE IS PROVIDED "AS IS"
* http://scopeplot.com/dg/wol.htm for more information.